Clinton R. Dawkins and Larry Krauss are leading militant atheists on another crusade. They have a new movie called Unbelievers. Perhaps they have to step up their efforts in spreading disinformation and stirring up emotions against that shadowy bogey man called "religion" and all its evils because they know that atheism is declining globally. Perhaps they're still upset because atheists do not score well in being liked and trusted. Perhaps the money is not rolling in as much as it used to be. Let's back up. Atheists complain that they're not liked. Why is that? Well, from this report about the movie from a source that I trust, it's the same kind of nonsense that they inflict on people all the time anyway. 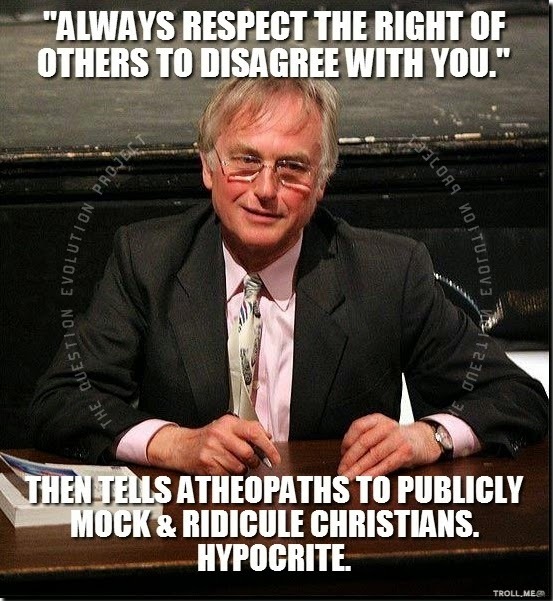 I am convinced that they are not disliked because they're atheists so much as because they're obnoxious. What do they do? Appeal to emotion. After all, people "think" with their emotions, and militant atheopaths manipulate people that way. Misrepresentation. A straw man can fool sheeple, and modern militant atheists have warehouses full of them, ready to deploy at a moment's notice. Prejudicial conjecture. Telling stories that are untrue as well as uninformed so they can further manipulate people. "Dawkins and Krauss said so, and I believe them!" Appeal to authority and double standards. When people have the unmitigated gall to question evolution, some of the Darwine drinkers will tell us that we have no business doing so because we do not have "qualifications". Yet they will listen to a theoretical physicist and a biologist as qualified authorities on matters of religion and how to run the world under the wisdom of militant, irrational atheism. Other Logical fallacies. Using bad thinking like conflation, ad hominems, the aforementioned straw man and more. Blatant inconsistencies. Telling people to "question everything", then atheopath drones go out and ridicule people who dare to question evolution, a foundation of the atheist religion. Illegitimate activism. They pretend to be the persecuted victims and want their followers to rise up and stamp out "religion". Well, it's been tried for a long, long time. And even if it did happen, who would be building schools and hospitals? Certainly not the Dawkins Foundation. Antipathy. These bullies loathe anyone who shows that atheism is inconsistent, arbitrary and irrational. And I have yet to encounter an atheist that will not lie to, and about, me or other creationists. Deceptive, manipulative and emotionally provocative things like this will only harm the already dreadful image that atheists have. They think they are highly intellectual, and then refer to reviews like this one from Answers in Genesis as "Anti-science bigotry", and claiming that "Ham and Purdom pretend to 'know' that it is all rubbish". Yeah, who is really the bigot, Poindexter? Such misrepresentation — no, let's lay it on the line — such a lie only illustrates the foolishness of the writer. Especially since Ham wasn't an author of the review. Anyone acquainted with logic and epistemology can easily see that atheism is incoherent. It is full of arbitrary assertions (another logical fallacy) and they do not have a consistent moral foundation. Pay attention and you'll see what I mean. But don't correct them (Proverbs 9.8), they tend to justify their fallacies with more fallacies and dishonesty. Thank God atheism and that negativity is dying. We can hope and pray that the emotionalism and flaming dishonesty of Unbelievers will not poison too many minds. Humanity's salvation cannot come through rejecting God. It can only come through Jesus Christ.